Sometimes, you just need to hear a portion of the story to decide if a book is right for you or your loved one. I've included a brief audio sampling from The Healing, recorded by me. (Click on the audio symbol at the top of the page.) 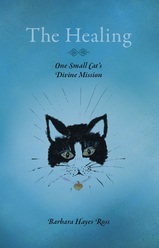 I hope to have the full audio version of The Healing, One Small Cat's Divine Mission, available soon. Until then, you can order the book in paperback. Order your copy today.